Designed to keep the focus on the TV, PLAYBAR’s modern one-piece design features a subtle matte cloth exterior and aluminum finishes. 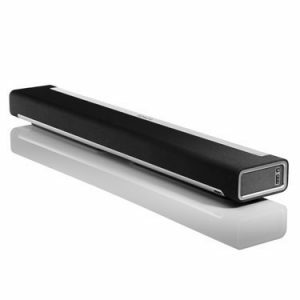 PLAYBAR can be set in front of the TV, on a TV stand, or mounted above or below the TV. PLAYBAR uses six mid woofers and three tweeters. To cast the widest sound-stage possible, the left and right tweeters have been angled outward. PLAYBAR performs 24 million calculations per second allowing each driver to add or subtract its output accordingly for perfect balance. PLAYBAR has Nine Class-D digital amplifiers perfectly tuned to match the speakers and acoustic architecture. Night Mode compresses the volume so you won’t wake the family. PLAYBAR plays all sources connected to the TV–including cable/SAT boxes, Blu-ray™ players, and video game consoles–through the single optical input on the back. PLAYBAR also plays all common audio formats from TVs, including Dolby Digital 2.0, Dolby Digital 5.1, and PCM. Plays all sources plugged in to your HDTV: cable/SAT boxes, Blu-Ray players, and video game consoles. If it’s connected to your HD, PLAYBAR will play it. Next Next post: Compunet Has Moved! !